Shashi Shekhar: As soon as I took my seat on the flight from Delhi to Varanasi and habitually peered at my mobile phone, a tweet by my journalist friend Nicholas Dawes flashed on the screen. Dawes had tweeted about a report by Human Rights Watch which spoke about the oppression faced by Rohingya Muslims in Myanmar. Before I could start reading the report, the air hostess began with the statutory safety announcement that concluded with: “Oxygen masks will automatically fall from the aircraft’s ceiling if the air pressure in the cabin becomes low. Please wear your own mask before you try and help the person sitting next to you.” This brought a smile to my face. The relationship between Rohingya refugees and Indian citizens is somewhat similar. The issue has already split the country on ideological lines. 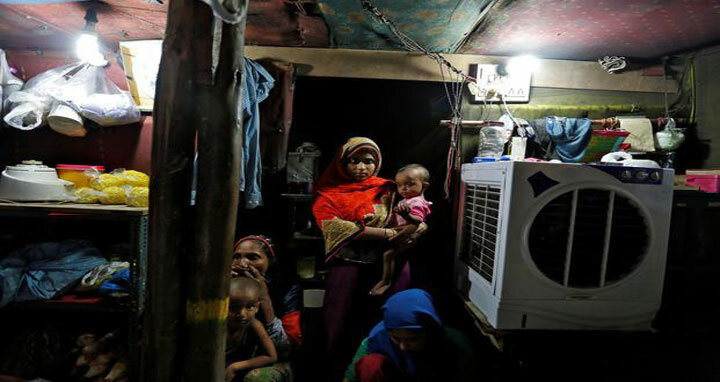 A new report by Human Rights Watch, where Dawes is deputy executive director, media, tells us that security forces in Rakhine state’s Maungdaw and Rathedaung have unleashed such a reign of oppression that 400,000 Rohingya were forced to seek shelter in Bangladesh. After the clouds cleared over Myanmar’s skies, satellite imagery revealed that in the last few days more than 90% of homes in 214 villages were been burnt down. Nobel Peace Prize winner Aung San Suu Kyi is the state counsellor of Myanmar. Suu Kyi finally broke her long silence on the subject on Tuesday. Addressing the nation for the first time on the issue, she said she had no objection to people returning to Myanmar provided they underwent a probe. The word “probe” was shocking for many. Suu Kyi said she isn’t perturbed by international pressure on the matter since it is Myanmar that is fighting terrorism at home. Members of the Rohingya community had also carried out attacks on innocents and the police. Despite this, if someone complains of torture by the security forces, she was ready for a probe. The instability reigning for 70 years needs to end, added Suu Kyi. To achieve this, the government had formed a peace committee and invited former UN secretary general Kofi Annan to lead the initiative. Is this just a coincidence that after 70 years, even India is bearing the brunt of social unrest in Jammu and Kashmir, anti-terrorism operations and large-scale migration? This is why not everybody in India is in favour of a large number of people from the Rohingya community setting up base in the country. At present there are 40,000 Rohingya refugees in India. Of these 10,000 are camping in violence-hit Jammu and Kashmir. Intelligence agencies and locals perceive them as potential security risks. The centre has filed an affidavit in the Supreme Court advocating sending back the refugees and sealing the borders with Myanmar. Some have strongly criticized this, reminding us about Indian civilization and the fact that refugees have been making India their home for hundreds of years and playing a constructive role in the evolution of our society. They say we should empathize with the troubles that the Rohingya community is facing. At the sentimental level, these subjects are good to discuss. But the subject is not so straightforward or simple. If you don’t believe me, recollect the explosions that took place on 7 July 2013 at Gaya’s Mahabodhi temple complex. The temple venerated by Buddhists all over the world was rocked by nine explosions. A conspiracy was hatched not just to blow up the temple but even the Bodhi tree that had been preserved over centuries in memory of the Buddha, the messenger of peace. The terrorists arrested in this connection later told the police that a conspiracy had been hatched to avenge the atrocities on the Rohingya community in Myanmar. Since then a question is being raised: Why can’t the people in whose solidarity the conspiracy was hatched, embark on the terror trail themselves? It is true that every Rohingya cannot be viewed as a terrorist but terror organizations such as the Islamic State and Al-Qaeda can succeed in indoctrinating them and turning them into terrorists. The history of terrorism is replete with examples of those seeking revenge for atrocities. It comes as no surprise then that questions are being raised. When your own house is on fire, how can you hope to put salve on the wounds of others singed by fire? In case you want, you can also recollect the air hostess’s statutory warning here. The summation of her advice is that in times of trouble, before you can help others, you have to secure yourself. Are we feeling secure enough to promise shelter and safety to others?